Bandung. 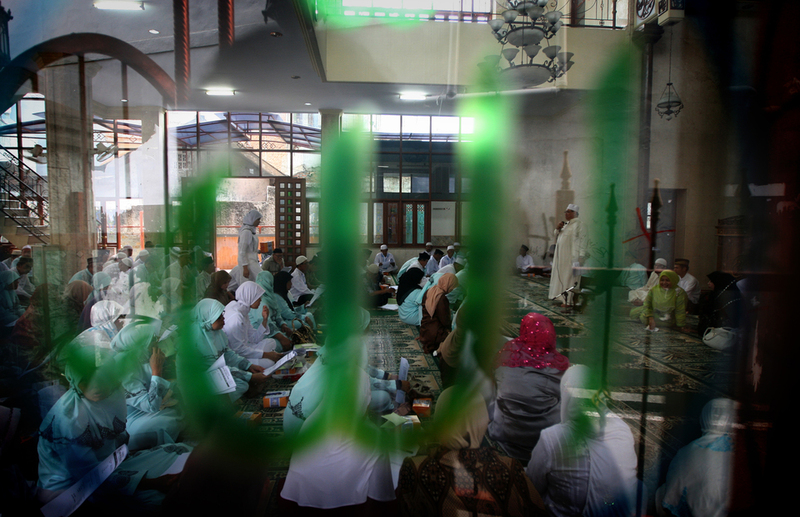 A spate of mysterious attacks on Islamic clerics, schools and mosques in Indonesia in recent weeks has ramped up tensions as the world's most populous Muslim-majority country heads into provincial elections and a presidential poll next year. Intelligence and Islamic officials believe that political forces are behind what they describe as a shadowy "black campaign" designed to whip up fear that Islam itself is under siege under the leadership of President Joko "Jokowi" Widodo. In one town near the capital, Jakarta, a mosque manager was stabbed and a religious scholar received an anonymous letter warning that 10 clerics would be killed. Videos of what police say are fake attacks on Muslim clerics and schools have also been distributed on social media, heightening a mood of unease. The attacks on the heavily populated island of Java have come as hardline Muslim groups press for a more conservative society and decry moderate politicians, posing a threat to Indonesia's reputation for tolerance and the democracy it won with the downfall of authoritarian President Suharto in 1998. Indeed, there are echoes today of the panics stirred up by Suharto, which typically involved attacks on religious figures and institutions and sometimes a communist scare to discredit politicians. Elections are due across the country in June for dozens of governors, district heads and mayors. Analysts see those polls as an opening skirmish before 2019's battle for the presidency. Ridwan Kamil, mayor of the city of Bandung and frontrunner to become governor of West Java province, says he has been hounded for months by hoax stories online that questioned the strength of his Islamic faith. "If you are not a Muslim, they will label you an infidel. If you are Muslim, they will label you not Islamic enough," Kamil said of his opponents in an interview with Reuters, declining to identify them. "They're trying to send a message ... that the country is not safe, that the government is failing, that we need to replace the existing government. Who gets the benefit? Whoever challenges Jokowi," he said, referring to President Widodo, whom he supports for re-election, by his nickname. The potency of religion as a swing factor in elections was graphically illustrated last year when the popular governor of Jakarta, Basuki "Ahok" Tjahaja Purnama, an ethnic-Chinese Christian and close ally of Jokowi, lost his bid for re-election after being accused of insulting the Koran. An online video of him speaking had been edited to make it seem that he was criticizing the Koran when in fact he was sniping at people who use a passage of Islam's holy book to warn Muslims against voting for non-Muslims. Ahok's ouster was spearheaded by the Islamic Defenders Front (FPI), a hardline group that organized huge protests against him in late 2016. He was later jailed for blasphemy. Reuters investigations into the recent attacks in Java showed that the FPI has been involved in stoking the tensions. National Police chief Tito Karnavian says the wave of violence has not been "massive or systematic," and he blames online activists for "spicing up" anxiety among Muslims. There have only been three actual assaults and about 42 fake attacks were promoted online, he said. Even so, intelligence officials, Islamic leaders and politicians say there is a concerted effort to sow discord through vandalism and threats to Islamic leaders, schools and mosques, reinforced through social media. Intelligence agency chief Budi Gunawan described it as a "rampant black campaign." A leader of the Islamic Union, a mainstream organization known as Persis, was killed in the early hours of Feb. 1 by a man wielding an iron bar. Senior Persis leaders told Reuters that 22 of the group's schools, mosques and teachers had been vandalized or received abusive phone calls since that incident. Someone, said Persis deputy chairman Jeje Zaenudin, is trying to "provoke a reaction." Mahmud Syaltout, deputy secretary general of the youth wing of Indonesia's largest Muslim group, Nahdlatul Ulama (NU), said NU schools and mosques have been targeted. One man who was caught vandalizing a mosque in East Java appeared to be healthy and feigning madness, he said. Jokowi's chief of staff, retired military chief Moeldoko, told local media someone was playing "old games," noting that deploying mentally ill people to create unrest was a tactic that harked back to the Suharto era. Pressed by Jokowi, the NU and another moderate Islamic group, Muhammadiyah, have stepped up grassroots efforts to combat fundamentalist movements. According to a recent survey, nearly 20 percent of high school and university students support the establishment of an caliphate rather than a secular state. On social media, much of the blame for the recent attacks has been laid on "communists" who - critics say have been allowed to flourish under Jokowi and his left-leaning Indonesia Democratic Party-Struggle. The government and independent analysts have said there is no credible evidence of a revival of Indonesia's outlawed communist party (PKI), once the world's second-largest. The party was decimated after soldiers and Islamic vigilantes slaughtered - according to some estimates - at least 500,000 alleged leftists and their families in 1965. Even so, Islamists, ultra-nationalists and elements of the military frequently warn of a resurgence. Analysts see the fomenting of a "red scare" as partly aimed at Jokowi, a reformist and moderate who has often been falsely labelled by enemies as a descendant of communists. Earlier this year, a homeless man, suspected of planning to attack a cleric at an Islamic boarding school in West Java, was beaten and accused of being a communist. The man was accosted by students as he paced up and down a lane by their school near the town of Bogor around 3 a.m. on Feb. 10, said Mahmud Mukhlis, one of the students. A pin was found inside the vagrant's bag that a local cadre of the FPI Islamic group declared was "a symbol of the PKI," Mukhlis said. The pin, viewed by Reuters, was in fact a name tag from a high school emblazoned with an eagle, Indonesia's national symbol. Members of FPI filmed the assault and shared the video on social media, said Mukhlis. Slamet Maarif, a spokesman for FPI, did not deny his group was behind the video. He said it needed to be proven that the homeless man's "communist" plot was a hoax, and described the incident as evidence of "an awakening" of the communist party. "The government should be following up, and not accusing the people of spreading a hoax," Slamet said. Police have arrested about 20 members of a network of online activists for spreading fake news about attacks on religious figures across Java. Known as the Muslim Cyber Army (MCA), the network was formed after the government shut down some of FPI's websites and social media accounts following anti-Purnama demonstrations in 2016. Police say they are investigating who funds and directs the MCA. FPI leaders have frequently praised the network, and have urged police to stop harassing it. For a decade, West Java province has been ruled by a coalition of nationalist and conservative Islamic parties that support Prabowo Subianto, a former Suharto-era special forces commander who lost the 2014 presidential election to Jokowi. In that contest, Jokowi was buffeted by an online smear campaign that he came from a family of communists and had Chinese ancestry. Warnings of a communist comeback are often linked to a surge in Chinese investment and workers in Indonesia, part of Jokowi's drive to revamp the country's crumbling infrastructure. Prabowo is expected to again challenge Jokowi, a moderate reformer currently riding high in opinion polls, in next year’s election. Prabowo was buoyed by the victory of a candidate he backed in last year's Jakarta governor election, but his Gerindra party's contestant to become governor in West Java is well behind Ridwan in opinion surveys. Gerindra's deputy secretary general, Ahmad Reza Patria, said the party had no links to the "vile and extraordinary acts" in Java. Prabowo has not commented publicly on the incidents. Bandung Mayor Ridwan said he has stepped up security patrols in his city following the wave of attacks, but he is in no doubt that they are politically motivated. "In my opinion, it is orchestrated," he said. "It's not just a person, but an organization trying to benefit politically through fear."